Robot Covers – R.J. Hanlon Company, Inc.
Download more details by entering your name and e-mail address below. 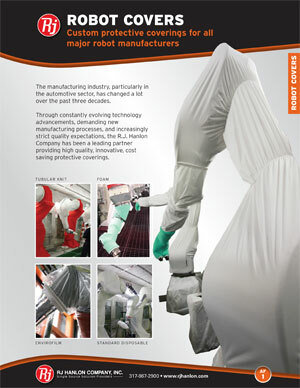 The R.J. Hanlon Company is proud to have been the first company to enter the paint robotics protective coverings business. Offering creative solutions to the frustrations associated with paint robotics, such as proper sizing, materials and change-out scheduling, we continue to be the industry’s leader. R.J. Hanlon Company’s Sales Engineers are knowledgeable when it comes to current robot manufacturers and models. We are experienced in working with such industry leading robot manufacturers as ABB, DURR, FANUC, Kawasaki, Kobelco, Kuka, MotoMan, Nachi, Reis, Staubli, Tokiko. R.J. Hanlon works closely in partnership with the Plant, Process and Maintenance Engineers, as well as Paint Managers and Supervisors to implement the optimal process. Download a FREE copy of the information details sheet for Robot Covers in PDF format by entering your name and e-mail address below. The document will be immediately delivered to your e-mail inbox. You’ll get more information with images, advantages, custom and premium cover options, and more. Our paint robotics covers are made of inherently lint-free materials and offer barrier backings to prevent the permeation of paint, solvents and chemicals. All fabrics, threads and other materials used are custom made and certified silicon-free. All logos, trademarks and servicemarks are the property of their respective owners.